I love flowers. They surround my house in MA and fill my decks here in Akumal. My friend Marcey on a couple occasions has brought me some very beautiful floral bouquets. I asked her where she was buying them and she told me Puerto Maya. 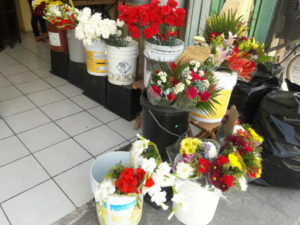 This is great news because it was either a trip to Playa or Tulum to find a flower vender, and by the time I got the flowers home, they were always a bit wilted. So I investigated and this is what I found: Take the road by the fabric store in the Chedraui complex and follow it for .6 m. (.96 k). Take a left onto the street that has the orange school with pale yellow trim. Follow along for another .2 m. (.32 k.), and the flower shop will be on your left. You really can’t miss it (!) 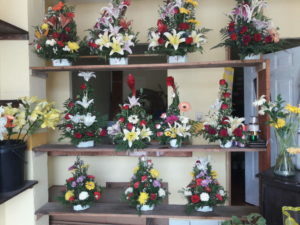 because flowers line the front of the shop. Lorena was the gal I spoke with and the shop is open every day. I had not been down that road in years. What a surprise. Lots of housing, many tiendas and pharmacies, along with small eateries, clothing shops, a shoe store and even a larger grocery story. One word of caution — Those 3-wheeled people-carries are all over the place! They swarm around like buzzing bees, so watch out for them. Add a little color too your life and stop to smell the roses.